If you have played Angry Birds or a bubble popping game, then you will instantly recognize the control mechanics of Dunk Shot. Basically you will need to pull the ball back and make sure the dotted aiming line points at the right direction, i.e. towards the next empty basket. The position of the next empty basket, direction of the aiming line/speed should be taken into consideration before releasing the ball. If the empty basket is higher above, but close to your basket, then you should make sure that the “curve” of the dotted aim line shouldn’t be horizontally flat and the direction of the line is perfect enough so that the ball lands safely in the basket. At first you shouldn’t aim for perfect shots and let the ball hit the rim before it falls inside a basket. Once you have mastered shooting consecutive hoops, you can try to achieve perfect shots. The speed at which the ball travels is crucial in sending the ball through the hoop successfully. The farther you pull the ball back, the faster it will go, so you wouldn’t want to pull it back too much in case the next basket is very close and tilted horizontally as the ball may bounce off the rim or the basket itself and fall down. You are safe if the ball falls back to the previous basket, but you will need to restart the game if it falls down. You will have to practice a bit and once you get into a good rhythm it will be easy for you to shoot hoops. Perfect shots are worth two points. A player achieves a perfect shot when the ball does not touch the rim on landing on a basket. Once you have practised enough, it might be somewhat easy for you to pull off back-to-back perfect shots to achieve combos. You will earn a bonus point for every combo, so when you achieve a perfect shot straight after another, you will receive 3 points. And if you get a perfect shot for the third time, you will earn 4 points and so on. 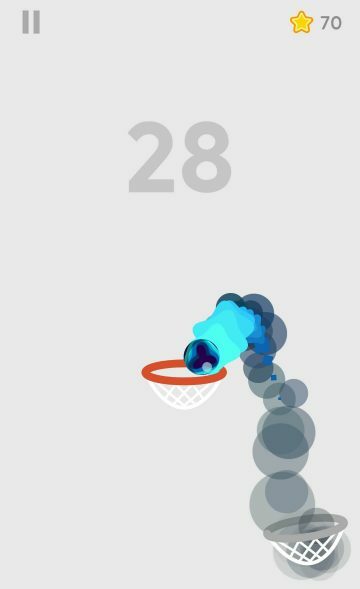 The ball bursts into flames when you achieve the third consecutive perfect shot, indicating that the combo is very much active. But if the ball touches an empty basket’s rim, the combo ends. Try to get perfect shots if you want to beat your previous score faster or get on top of the leaderboard. 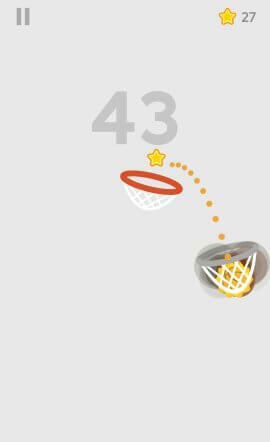 You can score 2 extra points when the ball bounces off a wall and drops in the basket. Your aiming line should point to the wall and the speed and angle should be accurate so that ball hits the wall and falls on the empty basket. It will require a bit of practice to get a bounce bonus, but it can be fairly achievable on static baskets and not moving baskets. Try to bounce the ball off the wall opposite of the basket and achieve both bounce shot and perfect shot to earn 4 points. There are some really cool basketball skins waiting to be unlocked. If you want to try out one, you will need to complete certain “missions”. 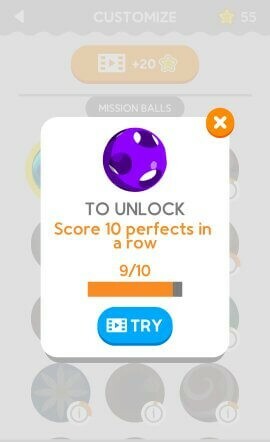 These are nothing but in-game tasks such as scoring 10 perfect shots in a row 10 times, reaching a certain high score, collecting an X number of stars etc. Tap the “customize” button to get a list of various skins. Now tap the tiny “i” located on the lower right of each skin to know what missions you will need to complete to get them. You can also try a new skin, but for that you will have to watch a 30-sec video. Some missions are fairly easy, but others are pretty hard and reset if you do not complete them on your first attempt. Make a note of such missions and be patient when completing them.